After announcing expansion plans into Brasil earlier in the year, The World’s Most International Festival Brand, ULTRA Worldwide, has officially confirmed its final plans for their 2016 South America Tour. With plans already well underway for the first edition of ULTRA Brasil in Rio de Janeiro (October 14 & 15), this year’s colossal takeover will now see ULTRA light up an additional FOUR countries across the continent from October 7-15, 2016. 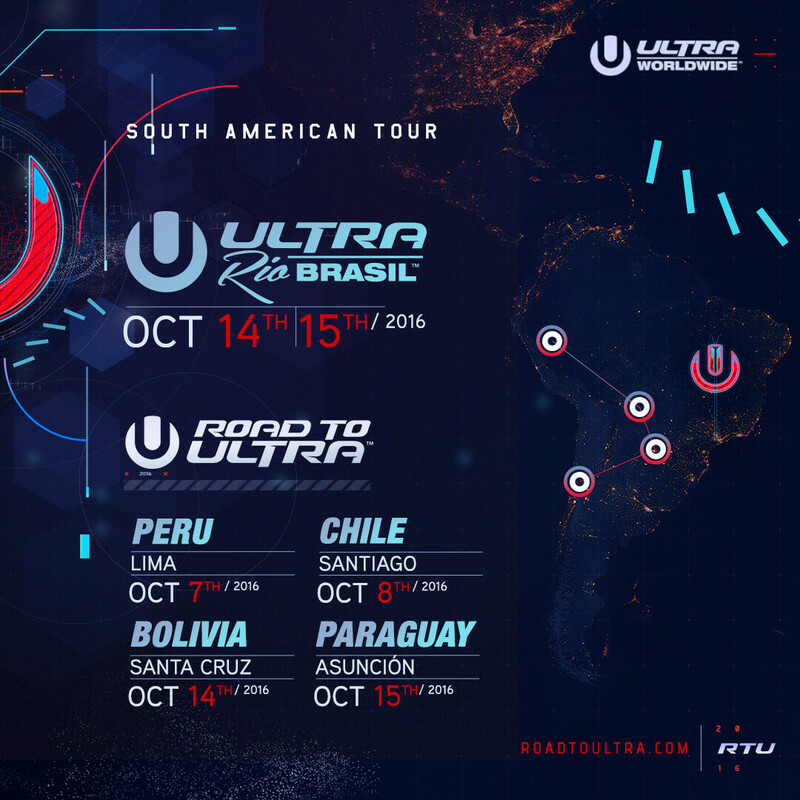 No stranger to the region, Road To ULTRA will be returning to Lima (Peru), Asunción (Paraguay), Santa Cruz (Bolivia), and Santiago (Chile) for another round of spectacular shows, before the historic finale in “Cidade Maravilhosa”—Rio. The first Road to ULTRA event will be held in Peru on October 7, where mile-long queues and over 20,000 diehard fans hit the beaches of Lima less than one year ago. RTU Peru 2016 will bring an unmatched fervor to the capital, igniting the dance-crazed country with next level stage production and top-notch talent. RTU Chile is the next stop on the tour, relocating from the 2014 RTU location of Ritoque to the Ciudad de Santiago. Powered by the same innovative team that produces the World’s No. 1 Dance Music Festival, ULTRA Miami, the thriving metropolis of Santiago will be shaken to its very core, no doubt leaving Chilean Ultranauts yearning for more. In 2015, Bolivian national radio station RQP hosted a competition to crown the country’s best electronic music festival. Naturally, the public voted RTU Bolivia as the nation’s favorite! As a result, RTU Bolivia will be returning in 2016, arriving in Santa Cruz on October 14 to entertain upwards of over 10,000 fans. Last but by no means least, RTU Paraguay will touch down in the bustling capital city of Asunción for the final stop of the Road To ULTRA outing, on October 15. Situated in the heart of Asunción, just off the Paraguay River, this return edition promises the out-of-this-world stage design, state of the art pyrotechnics, and the first class lineup that characterizes every ULTRA event across the globe. In a historic moment for ULTRA Worldwide, the South American tour concludes with the first ever Rio de Janeiro based edition of ULTRA Brasil taking place on October 14 & 15. Tier 1 and 2 tickets for this blockbuster event have already SOLD OUT months in advance, despite the mostly unreleased lineup. Tickets are now back on sale, and with the only known headliners being Carl Cox and Martin Garrix, anticipation for this debut event is at an all time high.